With their near true blue color and profuse bloom, cornflowers, also known as Bachelor's Buttons, are popular garden flowers. Although cornflowers are native to Europe, where they got their common name because they often grew in corn fields, they have made themselves at home in North American and can be found naturalizing throughout most of the continent. Sometimes they grow too well; Tennessee and Maryland have reported cornflowers becoming invasive. Leaves: The lower leaves have a curved lobe (lyrate-pinnatifid) but the majority of the leaves are narrow and lanceolate, growing in whorls around the long stems. Flowers: The darker center flowers are surrounded by overlapping bracts and are about 1.5 inches across. The most widely known cornflowers are almost true blue, but they also come in shades of white, pink, lavender, maroon and two-tones. The flowers are not just beautiful, they are also edible. Cornflowers are annuals that can be grown just about anywhere, from USDA Hardiness Zone 2 through 11. They should be planted during the cool season and will decline as the weather heats up. 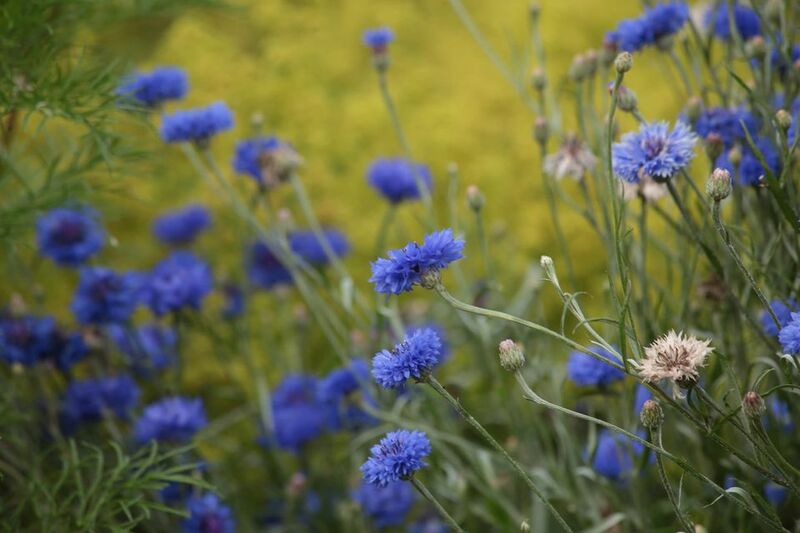 To get the most blooms and sturdier stems, plant cornflowers in full sun. They can take a little shade, especially in the afternoon, but will perform best in all day sunshine. Cornflowers have a somewhat bushy base with lots of long stems jutting out the top of the plant. While they will reach a mature size of about 1 - 3 ft. (h) x 1 - 2 ft. (w), most of the height is stems and flowers. Peak bloom time is May through mid-summer, but you may be able to prolong the blooms with frequent deadheading. Very often you will find seed packets that are simply labeled cornflower, cornflower mix or sometimes labeled by color. There are named varieties of cornflowers out there, but as new ones are introduced, older varieties can disappear. However, it is very easy to save your own seed if you should find a variety you truly love. Centaurea cyanus "Blue Boy" - Probably the most popular Bachelor's Buttons, with double flowers in "cornflower blue". Centaurea cyanus "Black Magic" - There are several dark purple flowered varieties, with 'Black' in their names. Centaurea cyanus "Dwarf Blue Midget" - bright, blue flowers on 6 - 12 in. plants. The dwarf varieties are nice for rock gardens and the front of a border or along edges. Centaurea montana is a perennial cornflower that is hardy in USDA zones 3 - 8. It blooms in late spring. Cornflowers are nice additions to all but the most formal gardens, They are a traditional cottage and meadow plants, but they also make great cut flowers and dry very well. For long-lasting cut flowers, cut them just before they are fully open when the centers are still curving inward. Cut in the morning, when they are still plump with water. Bachelor's Buttons complement most mid-spring flowers, from Bleeding Heart to spiky iris. The blue varieties blend well with pastels and are particularly striking next to yellow flowers and foliage. Soil: Cornflowers are very adaptable and will grow in the poorest of soils. Ideally, they prefer a neutral to slightly alkaline soil pH. Planting: These are cool weather flowers, meant to go into the garden at the start of the season. If you would like to get a head start, you can start seed indoors, 6 - 8 weeks before your last frost date. The seed also does well when direct-sown right around the last spring frost date. Plants that are allowed to go to seed will probably self-sow. Minimal watering and no fertilizer is needed to keep these annuals going. Established plants can tolerate dry soil, but regular water will keep the plants healthier. The plants can become floppy and can be flattened by rain or wind. You could stake them while young or simply plant them near taller plants that will support the stems, as they grow. You can deadhead, to prevent self-seeding if they become a nuisance, but many birds will eat the seeds. Since cornflowers are grown as annuals, they don't usually have the time to develop serious problems. However, they can occasionally be prone to powdery mildew, wilt, rust, and rots and are attractive to aphids and mealybugs.